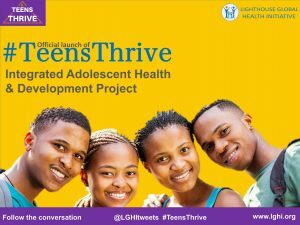 LGHI is proud to announce the official launch of an integrated adolescent health and development project tagged “Teens Thrive” with a $5,000 grant from Women Deliver, USA and institutional support from Hewlett-Packard (HP). Teens Thrive is a six (6) months project to be implemented in Osogbo, Osun state. The project will leverage on technology to improve adolescents’ health and leadership potentials by providing adolescent-friendly platforms where health education, professional counseling, and referral services are offered on life building skills, sexual and reproductive health and rights (SRHR), HIV/AIDS, mental health, non-communicable diseases, and substance abuse in an integrated manner. Globally, there are 1.2 billion adolescents, which represent the highest number ever observed in human history. Reports show that while the overall number of HIV-related deaths is on the decline, HIV deaths among adolescents are rising (http://www.who.int/en/news-room/fact-sheets/detail/adolescents-health-risks-and-solutions). Mental health has been ranked as one of the first three leading causes of deaths among adolescents with higher cases of depression and suicide (including suicide attempts) being reported. Non-communicable diseases in adulthood oftentimes are developed years earlier usually at teenage years. The benefits of investing in adolescents are enormous. Lancet commission on adolescent health suggested that investment into adolescents’ health and development has a potential for threefold benefits – it helps the adolescents to survive the risks associated with the phase, it protects them in the future from chronic diseases that start in adolescence and it models healthy lifestyle for the next generation of adolescents. Investment in adolescents also has economic and social benefits amounting to 10 times more than they cost, by saving 12.5 million lives, preventing more than 30 million unwanted pregnancies, and preventing widespread disability. “Teachers, parents, and guardians often assume that good academic performance should be the only concern of adolescents but they often forget that adolescents are in a transition phase of life where their sense of value and belief system is being formed. Sometimes, these expectations if not properly managed push adolescents to some unhealthy behaviours and relationships,” said Adebisi Adenipekun, President of LGHI. “It is time for adolescent gatekeepers to accept that adolescents are not as healthy as they seem and they need to be understood and engaged on issues that affect them. This is what Teens Thrive project is all about – empowering adolescents and providing a platform for them to influence their peers positively”. Lighthouse Global Health Initiative (LGHI) is a non-profit organization which envisions a world where vulnerable populations (especially adolescents, girls, and women) are empowered to lead healthy and productive lives. Our strategy for achieving this vision is through our CARPPS (Capacity building, Advocacy, Research, Public health interventions, Partnerships and Service delivery) approach.